Manufacturers have been pushing proprietary apps to the Play Store for a while now, because it allows for faster and easier updating of apps without needing to go through the over-the-air process for updates, which users can choose to ignore. Updates through the Play Store are much easier to automate. The latest app to come to the Play Store is Samsung's S Note app. The S Note app is on most Samsung devices, but is one of Samsung's star apps for the Galaxy Note series because of its use of the S Pen. Users can pull out the S Pen to draw something, jot down a note, or annotate a picture or screenshot. The S Note app in the Play Store doesn't seem to have anything especially new compared to what Galaxy users are used to though. The app is still rolling out, but it should eventually be compatible with most Samsung devices. The listing confirms that the app will work on Samsung devices that don't use the S Pen, but functionality that requires the S Pen will be missing on those devices. Interestingly though, users with non-Samsung devices have reported being able to install the app with mixed results. A user in Switzerland with an HTC 10 claims to have successfully installed the S Note app. Someone with an LG G4 could install it, but the app would force close without opening. It's unclear if this means anything though. Maybe Samsung didn't lock down the app properly and support for non-Samsung devices will eventually disappear. But, it could be that Samsung is actually planning to extend support for the app to non-Samsung devices. The latter may seem unlikely, but maybe Samsung wants users to try the app, see that there are cool things to be done if only they had an S Pen and switch to a Galaxy Note? Stranger things have happened. I agree. The best S-Note was on the Note II and 3. However even though they remove many features, you can get them back. if you go into Samsung's Galaxy Apps, you can search for a app called S Note Templates. This will bring back all the templates from the older Note versions, since you can no longer install older S-Note versions. On my Note 4, I simply downloaded the old Note 3 S-Note and installed it, to get all the template and then upgraded to the recent. Can't to that on the Note 5. So Samsung made the templates available as a download. In fact, you can almost install all the old S Note features, if you know what they are, search for them in the Galaxy Apps store. Surprised it's not in the Galaxy Apps store. Yes it is. You just don't know how to search for it. Here is proof -https://flic.kr/p/GmP1R9 You're searching for it wrong!!!!!!!!!! PA never tries to give any information. So half-assed. For anyone with a Galaxy or Non-Galaxy phone that doesn't feature the S-Pen, you can have access to many of the S-Pen features which you can activate with your finger of use with a Stylus. If you install S-Note on a non-Galaxy or Galaxy that doesn't have an S-Pen, you have to go to the Play Store and install, the Spen SDk (64Bit) if your phone has a 64Bit CPU. There si also a 32Bit version 32bit -https://play.google.com/store/apps/details?id=com.samsung.android.sdk.spen30&hl=en 64bit -https://play.google.com/store/apps/details?id=com.samsung.android.sdk.spen30_64&hl=en This small kit is required to make Spen like feature work on devices that don't have an Spen. Now what I noticed by default, when I had mu S6 Edge and Edge+, is that when you install S-Note and you clicked on any tool that required the S-Pen, you will get a popup inside the apps which is a link to the Spen SDK at the Play Store. Once installed S-Note will automatically detach it and you don't have to restart S-Note for the feature to take effect. Now to be upfront, I have ONLY use this on Galaxy devices like the S6 Edge and S6 Edge+, I dont know how the app will work on a non-Galaxy device. But I think it should work just fine. What this SDK does specifically, is turn on the features that can't be activated by touching. They are activated by the S-Pen. The native application tools for the SpEn will all become available. The only tools that don't work are those that depend on using the button that is on the SPen. Hwoever, you can still choose them from the tool menu and hey will work the same. For example, S-Note has the ability to take written text and turn it into typed text, or take a shape you draw and make it perfect. This tool is activated by the SPen by clicking the button on the pen and drawing a circle around the text or shape. The SPen SDK will allow these tool to function as normal, you just have to manually active them from the menu. In fairness to PA, only someone who has used a Note for years and then switched back to a galaxy S for example and installed S-note woudl know this. But this should be helpful info. Would be great if someone with a non-Galaxy device would share their experience as to what the results of this install does for them. S-Note will work on any Galaxy device, but you need to install the SDK for the rest of the functions that support the S-Pen. The S-Note app has been available in the Galaxy app store from Samsung since the Note 4. It will install and works on any Galaxy device whether it has an S-Pen or not. It doesn't need to become compatible with any Galaxy branded Samsung. 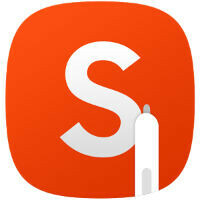 The app in the Play Store is the same app that si on the Note. The S-Pen features can be used if anyone install the SPen SDK which I posted above. PA shoudl really not just post an article that has a problem, without investigating a solution. all you had to do PA is install the app on a galaxy device, and tried to use the SPen feature and see what the phone does next. It provides a solutions from inside the app. You're so use to using an iPhone which offers no solution to its problems is you think every phone is that dumb. THEY AREN'T!